Sometimes you might need to look for someone in a specific position on LinkedIn rather than for a specific person. After all, who knows what you go through better than other people with the same job, right? Who better to give advice on a topic like search engine optimization (SEO) than someone whose job relates to SEO? Enter the job title in the Title box provided. To search for only those people who currently have that title, change the drop-down list choice to Current. If you leave the default choice of Current or Past, your search results will include all the people who have ever defined that job title in one of the positions on their LinkedIn profiles. 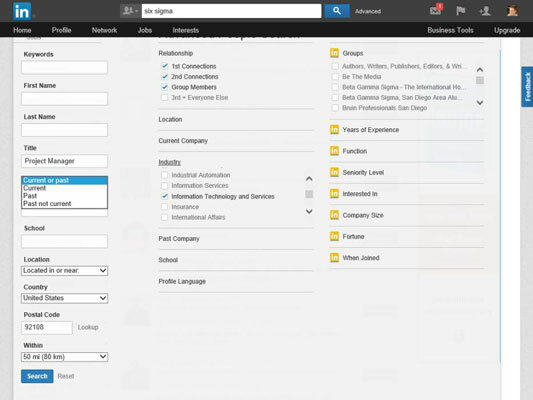 Select at least one Industry from the list provided so your search results are relevant to the job title search. This step is highly recommended. After all, a Project Manager in Construction is completely different from a Project Manager in Computer Software. Click the word “Industry” in the center of the screen to bring up the list of industries you can select from. You can actually select multiple industries from the list. Simply scroll through the list and select the check box next to each industry you want to select. Click the Search button to see your results. You see a set of results that match your job title request. You can use the filtering options on the left side of the Search Results screen and the middle of the screen to add more information and get a more targeted list.